VISSCHER - Dominii Groningae nec non maximae partis Drentiae Novissima. Delineatio per Nicolaum Visscher. VISSCHER, N. - Dominii Groningae nec non maximae partis Drentiae Novissima. Delineatio per Nicolaum Visscher. Dominii Groningae nec non maximae partis Drentiae Novissima. Delineatio per Nicolaum Visscher. - VISSCHER, N.
Title : Dominii Groningae nec non maximae partis Drentiae Novissima. Delineatio per Nicolaum Visscher.. Size : 18.5 x 21.3 inches. / 47.0 x 54.0 cm. Description :Map of Groningen and Drenthe in the north-east part of the Netherlands. Inset upper right corner of the "Wadden eilanden" entitled Caerte van de Groeninger Eylanden ende Watte. Very decorative title cartouche etched by Romeijn de Hooghe. Taken from the atlas Germania Inferior, sive XVII Provinciarum Geographicae generales ut et particulares tabulae. 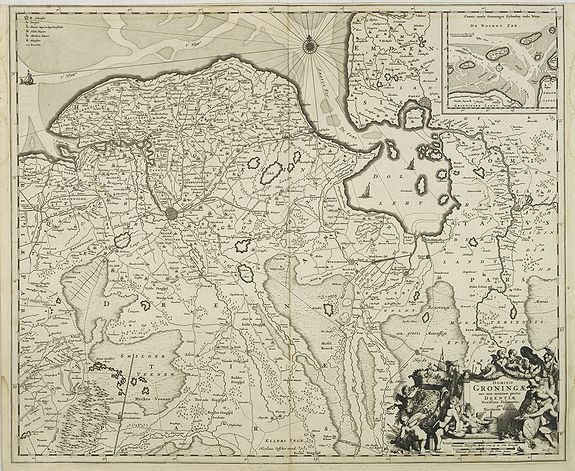 Kaert-Boeck van de XVII Nederlandtsche Provincien published by Nicolaes Visscher II which contained 21 maps of the Netherlands. Condition : Some very light marginal spotting. Else dark and good impression on thick paper. Upper margin cut short. Good condition.